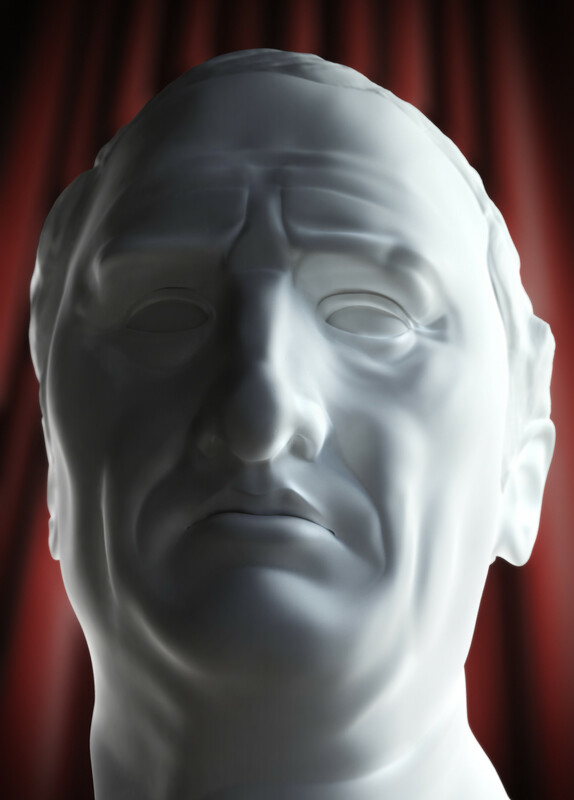 One of the most famous secondary sources on Stoicism is a collection of six essays by Cicero (who considered himself an Academic Platonist, but was sympathetic to Stoicism), entitled Paradoxa Stoicorum, or Stoic paradoxes. Indeed, the Stoics were well known for a number of precepts and standard phrases that sounded decidedly paradoxical to the uninitiated. “Preferred indifferents” anyone? Some of the critics of Stoicism, then as now, took these “paradoxes” as indication that the Stoics were just playing with words, and that their doctrines were not in fact much of an innovation over, say, those of Aristotle. Cicero disagreed, and took the Stoics seriously enough to engage a number of these alleged paradoxes in detail. He wrote the six essays in the form of a letter expounding on Stoic doctrine, addressed to Brutus, Cato the Younger’s nephew and one of the co-conspirators against Julius Caesar (as well as the husband of one of the few famous Stoic women, Porcia Catonis). The six paradoxes considered by Cicero pertain to the following Stoic claims: (i) that virtue is the only good; (ii) that a man who is virtuous doesn’t lack anything for the happy life (external conditions are indifferent); (iii) that all bad actions are equal, and so are all the good actions (i.e., there is no gradation of good and bad); (iv) that every fool is a madman; (v) that the wise man alone is free, everyone else being a slave; and (vi) that the wise man alone is rich. Here I agree with Cicero’s treatment: the idea that virtue is the only true good, which the Stoics inherited from Socrates (see the Euthydemus) is fundamental to the philosophy, and — together with the accompanying notion of preferred and dispreferred indifferents, distinguishes Stoicism from the allied philosophies of Peripateticism and Cynicism (see this post). Cicero readily agrees with the Stoics here too. He begins the essay by mentioning one of the Romans’ heroes, Marcus Atilius Regulus, who was captured, tortured and eventually killed by the Carthaginians, and yet bore everything with utmost integrity and courage. Marcus, says Cicero, was not unhappy — where of course “happiness” here does not mean a feeling of elation (which would hardly be appropriate, or humanly possible, given the circumstances), but rather eudaimonia, the sort of life that is worth living, in the case of Marcus because he was helping his country prevail against her powerful rival, even at the cost of his personal suffering and death. Here too, I find myself in complete agreement with the Stoics, and therefore disagree that the notion is “paradoxical” at all. Once we understand that happiness means eudaimonia, and particularly Stoic apatheia, or equanimity toward circumstances, then it readily follows that indeed no external can possibly get in the way of it, not even torture and death. Only the Sage, the perfect Stoic, is said to be “happy” on the rack, but apparently Marcus Regulus got pretty close. The basic idea, explains Cicero, is that crimes are to be measured not by their consequences, but by the intentions of the perpetrators. So there is no difference between killing a slave (yup, that’s the sort of time we are talking about!) and killing your father. In fact, Cicero says that some times it is more objectionable to do the former than the latter, depending on circumstances. The analogy introduced to make the point is this: “A pilot oversets a ship laden with gold or one laden with straw: in value there is some difference, but in the ignorance of the pilot there is none.” Well yes, sort of. Here I can appreciate the logic, but I’m just not going to buy the outcome. This is a way to explain the strange Stoic notion that only the Sage is wise and everyone else is a fool, something I have written about in the context of the drowning man metaphor. As I said, I appreciate the reasoning, but I don’t feel compelled to agree. It goes on like this until the end of the essay. I take his point to be that it is insane, not just merely foolish, to put oneself into the hands of Fortuna by valuing externals. But since this is what everyone does, except for the wise man, then not only we are all fools, we are insane. Well, okay, but you know, in a country of fools, it is the sane person who is going to go mad. This is a second instance where I can appreciate the logic, and even that the argument is meant — just like the preceding one — as an invitation to humility (we all do bad things, we are all fools or mad). But perhaps one could be reminded of that in a more charitable, and less “paradoxical” fashion. Notice the acknowledgment in the last sentence that these words are “surprising,” i.e., paradoxical in the sense used by Cicero in these essays. But, indeed, I agree that, as a matter of fact, we are often slaves of our cravings for external things, and that freedom does lie in treating them with indifference. Wait a minute, though. Aren’t we in danger of entering Cynic territory? Are we supposed to do without externals at all, in order not to be slaves to Fortuna? What happened to the “preferred” part of preferred indifferents? This, I think, is one of the crucial — and most useful — points of Stoic philosophy. By all means, enjoy whatever material goods Fortuna throws your way. But treat them always as temporary gifts, and be prepared to relinquish them with equanimity when Fortuna takes them away. They are indeed the playthings of boys (or girls), not the shackles of men (or women). This is the sort of beautiful prose for which Cicero was justly famous. But it is the meaning of the words, not their form, that is really of lasting value. Our own character is the most valuable thing we have, the only good that is always useful, and the only one that nobody can take away from us without our own consent. It was true more than two millennia ago, and it is still true today. This entry was posted in Cicero on April 18, 2017 by Massimo. Reading your stoic essays always sets me to thinking. The phrase, Aspirational Ethics, looms in my mind. It is out there in google land but not in the way I would use it. The ‘paradoxes’ of stoicism can be explained, it seems to me, in terms of Aspiration. The great exemplars of Stoicism all failed and that is held against Stoicism. Wrongly, because none of them claimed to be the Sage. Aspirational ethics can also explain the bad man or woman. They aspire to an ethical end which is not admirable. I have been playing with how an aspirational ethic fits in with evolutionary ethics, and how these two cohere are close to the very core of what ethics is about. Our emergent properties of reason, sense of freedom, loyalty to the tribe can produce the most horrible reality or occasionally an ethic or society which is beautiful, based on love, and universal is scope. It has very little to do with organized religion, although from an evolutionary point of view Religion may be an essential element in its emergence. A small mistake here – you have quoted the phrase “If a player dances ever so little out of time, if a verse is pronounced by him longer or shorter by a single syllable than it ought to be, he is hooted and hissed off the stage.” twice.